The discovery of a species of frog which rears its young in its stomach stunned the world of science. When the female of Rheobatrachus silus was found in 1973 in south-east Queensland, Australia, she was observed to give birth to live young through her mouth! The mother frog swallows her eggs after fertilization, and then stops feeding. For six or more weeks these eggs develop and pass through a type of tadpole stage, all inside the stomach, without being digested or passed further along the intestine. The frog’s stomach is quite normal—it secretes hydrochloric acid and a powerful enzyme which together would normally break down and digest anything in the stomach. However, the jelly around the eggs contains a special chemical which not only ‘switches off’ the production of the acid (thus halting the digestive process) but appears to prevent the stomach from discharging its contents further down the gut. This chemical, prostaglandin E2, also relaxes the stomach wall, enabling it to thin out and expand to an enormous degree. (More of this chemical is produced by the tadpoles after they form.) Because there are as many as 26 young at a time, which do not emerge until they have fully formed limbs, parts of the hugely distended stomach become as thin and transparent as a plastic bag. ‘Giving birth’ has been known to happen with one huge vomit emptying out the stomach; however, it is more usual for the births to be spaced out one at a time, over as long as a week. To do this the mother comes up to the water surface and relaxes her gullet. This allows a baby frog to come into her mouth and sit on mother’s tongue before making its debut through her wide-open jaws. It is mind-boggling to try to see how an evolutionist would begin to imagine how a frog species successfully reproducing by egg-laying and a free-swimming tadpole stage could or would have changed, by trial and error mutation/ selection, into a stomach-brooding one. Neo-Darwinism insists that evolution happens by a series of accidental changes (mutations) to the stuff of inheritance; each of these changes must somehow make it more likely for that inherited information to be passed on to the next generation, in order for it to be favoured by natural selection. 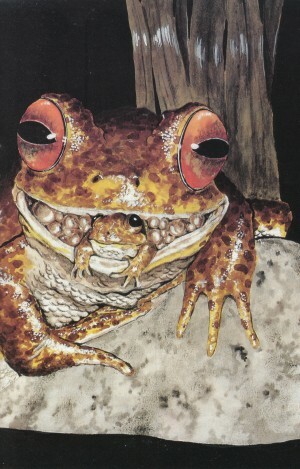 Many experts think the ‘wonder frog’, Rheobatrachus silus, is now extinct. It is known from only one stream, in the Kondalilla National Park between Montville and Mapleton in Queensland, Australia. In the mid-1970’s, more than 100 of the frogs could be seen in one night. Now they are not seen at all. In fact, the last recorded sighting was in December 1979. Some frog-lovers are hopeful that Rheobatrachus will be found again. It is Australia’s only truly aquatic frog—spending most of its time on the stream bed or hiding under the countless submerged rocks and boulders in Kondalilla’s rainforest stream. It should be obvious, though, that suffering a mutation which makes it more likely for you to eat your own eggs is hardly likely to make your offspring more fit to survive and reproduce! The living world is full of such remarkable wonders which require the most tortuous and imaginative efforts by evolutionists to show how they could have ‘just happened’ without deliberate purpose and design. In reality, they testify to the amazing ingenuity of God the Creator, and the diversity of His handiwork. As the Apostle Paul tells us in Romans 1:20, ‘the invisible things of Him from the creation of the world are clearly seen, being understood by the things that are made’. Another species of this frog, Rheobatrachus vitellinus, was discovered in central coastal Queensland in 1984. Both may now be extinct. This leaves many other questions unanswered—how do the young get their oxygen and secrete their wastes, for example? Interestingly, the stomach in R. vitellinus stays normal throughout, without thinning and dilation. Further reading: M.J. Tyler, Australian Frogs. Viking O’Neill, 1989, pp. 153–162. 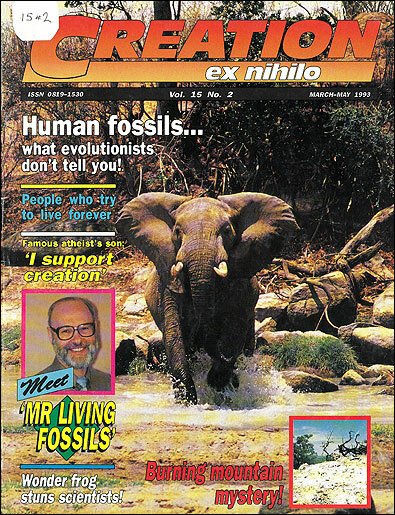 Scientific American, July 1992, pp. 64–65.